I'll probably go for AudioEffX at $5. It's down from $14.99 in April. It has been sitting at $9.99 for a while. Only reduced to $7.99 now, but it has been reduced by nearly half from the highest price, so still a good deal considering the price history. Even for owners of Samplr, Egoist, Yellofier, Gadget + Abu Dhabi and Sector? I have Blocs Wave slicer IAP, Abu Dhabi, and who knows what else. Ooooh exciting. How do we know this? HOT DAMN!!! That. Is. Awesome. Anybody use Poseidon? It’s been on sale for as long as I can remember. I’d probably jump in without thinking if it were AU... but that’s just because I’m greedy. Sincerely, GET THE TAP DELAY! oh hell yes!!!!! Cant wait!!!! I like Cube and Poseidon a lot, but Tap Delay was a waste of money. Being able to compare Dubstation 2 and Tap Delay side by side, I'd conclude that Tap Delay looks better "on paper" but Dubstation 2 is the one that will provide the better and more musical delays. I was very excited at first to finally get a delay with manually sequencing taps (16 steps), but the way this is implemented will make it hard to get great-sounding results easily. And no, I don't accept time-consuming workflows on the iPad. Filtering is very unflexible too. Then, all taps have the same level which in most cases sounds very unnatural, and the fact that there have not been any feature and usability updates for a long time don't make it better. If you want weird stuff, go for Tap Delay. If you want useful, musical delay, go for Dubstation 2. I just bought arpeggist and I think I might be regretting it. It's a 'bread & butter do it all' FX thing. 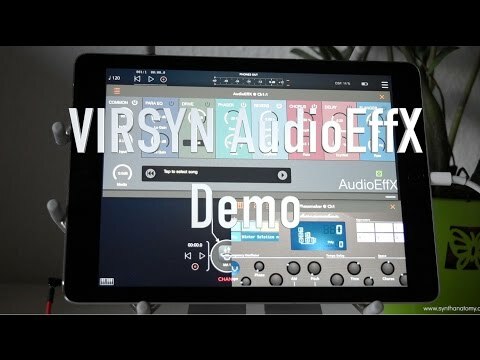 If you're ok with the effects in Virsyns other apps you'll get more of those in Effx. I think it’s cool. Not stunning quality-wise to my ears, but a quick and dirty way to get some fun results. For Multi-FX I'd probably rather get Turnado or, if you prefer rhythmical, Effectrix. They're on sale too.